If you're reading this, you are likely in the market for a new car and doing a lot of research. Depending on where you are looking, you may have noticed multiple prices for the same vehicle. For instance, TV commercials may advertise a 2018 Toyota Corolla differently than the pricing you may see on a website. This may lead to some confusion but the reason is pretty simple. Many commercials will only show you the MSRP of the vehicle (Manufacturer's Suggested Retail Price). 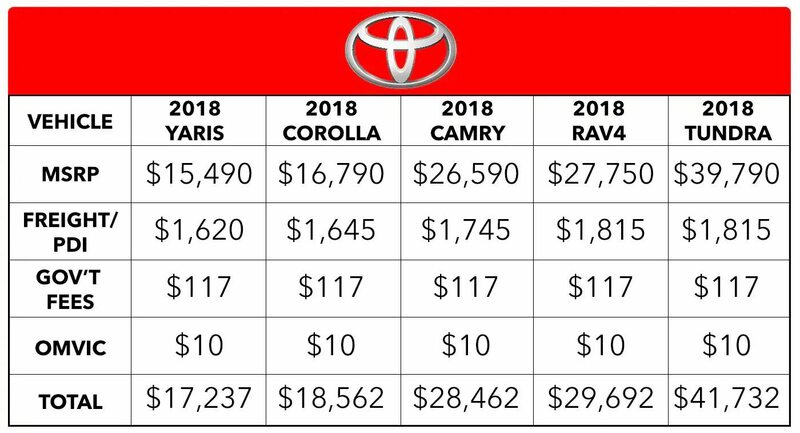 The MSRP is set by the Manufacturer, in this case Toyota, as a suggested price to sell the vehicle at and is the only price that legally has to be shown. 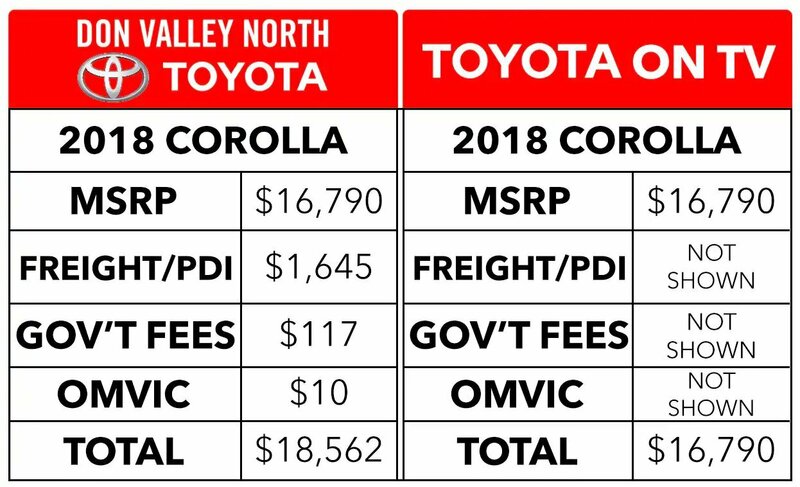 However, at Don Valley North Toyota, we want to be up front about our prices, which is why we choose to include all fees in our pricing. In Ontario, all dealers must advertise their pricing according to OMVIC (Ontario Motor Vehicle Industry Council) regulations. One of those laws is, we must advertise the "All-In Price", which is MSRP (Manufacturers Suggested Retailing Price) plus all applicable fees and levies such as Freight & PDI, the Environment Handling Fee, OMVIC Fees and Tire Levies. Not all advertising always complies with this law and sometimes you will just see MSRP Advertised. All dealers will charge the "All-In Price", but you might not know that until you're sitting at the negotiation table. At Don Valley North Toyota, it has always been our policy to be upfront, honest and clear about our pricing. See the graphic above for a complete breakdown of pricing. OMVIC stands for Ontario Motor Vehicle Industry Council. OMVIC's mandate is to maintain a fair, safe and informed marketplace by protecting the rights of consumers, enhancing industry professionalism and ensuring fair, honest and open competition for registered motor vehicle dealers. Dealers are required to remit $5 for applicable transactions as of February 1, 2008. The applicable date for determining whether a particular transaction is subject to the transaction fee is the date the agreement with the customer was entered into (i.e. not the date the vehicle is delivered or the date registration is transferred to the customer). The Ontario Motor Vehicle Industry Council enforces the Motor Vehicle Dealers Act (MVDA). "As the regulator of motor vehicle sales in Ontario, OMVIC's mandate is to maintain a fair, safe and informed marketplace by protecting the rights of consumers, enhancing industry professionalism and ensuring fair, honest and open competition for registered motor vehicle dealers. It's important car buyers understand the protections and rights they have depends entirely upon whom they buy from. Consumers who purchase from registered dealers are protected by OMVIC and are entitled to full disclosure and all-in pricing. Consumers who buy privately have NO protection; no consumer law covers private transactions." For full information on OMVIC please see this website. An Ontario Ministry of Transportation (MTO) Safety Standards Certificate (SSC) is a document that certifies a vehicle's fitness. You can buy and register a vehicle without a safety certificate, but you cannot put your own plates on the vehicle or drive it without one. Any inspection station in Ontario licensed by the Ministry of Transportation can issue a Safety Standards Certificate, provided your vehicle passes an inspection. A Safety Standards Certificate is valid for 36 days after the inspection. However, the certificate is not a guarantee or warranty that the vehicle will stay fit for any period. For the purposes of transferring ownership, an SSC is valid for 36 days from the day that the SSC was issued. Genuine Toyota parts and accessories are sold through our Parts Department. Our Parts Personnel can determine the availability and price of the parts and accessories required, and can assist in the processing of your order. There may be differences between genuine Toyota filters and aftermarket filters. Genuine Toyota filters are designed and engineered to fit Toyota vehicles specifically and to maintain the filtration of dirt or particles within the oil to match the recommended oil change interval of 8000 km. Aftermarket filters may not have the same fit or be manufactured to the same standards as genuine Toyota filters and may cause engine concerns. Where can I learn about Club Toyota, and how can I register? Club Toyota is a complimentary on-line service for owners/lessees of Toyota vehicles of model year 1996 or newer. For information on Club Toyota, visit www.clubtoyota.ca. On the Club Toyota Login page, click on "Learn more about Club Toyota" to take a guided tour of Club Toyota. Click on the Register Now button and perform a New User registration. On the Registration page, enter your Vehicle Identification Number (VIN) and other required information. Your VIN can be found on your vehicle insurance document, your vehicle registration, on top of the dash of your vehicle, or on the driver's side door of your vehicle. Use the computer-generated temporary User ID and Password provided to you when you complete the online survey with a link provided in a welcome letter sent to you after the purchase or lease of a new vehicle. Why should I service my vehicle at a Toyota dealer? Does my Toyota vehicle have a timing belt? Please remember, daytime running lights (DRL) are a safety feature that can help make it easier for others to see the front of your vehicle during the day. This is especially helpful in the periods right after dawn and before sunset to increase visibility to other motorists. If your vehicle is equipped with a "DRL OFF" setting, they can be turned off by twisting the headlight control knob to "DRL OFF." For vehicles listed below equipped with DRL, the system can be disabled by your local Toyota dealership. Be aware that models equipped with the Automatic Headlamp feature will default to a standard or manual headlight function and will no longer turn the headlamps on automatically after this modification.Please contact your local Toyota dealership for details. For all other models equipped with DRL, Toyota does not recommend any modifications. Where do I find the recommended tire pressure for my Toyota? What precautions do I need to take during the break-in period for my new Toyota? A few simple tips for the first 1,600 km can add to the future economy and long life of your new Toyota. These tips can be found in your Owner's Manual. Refer to the index for the exact page location. What are the "S" and "B" gear shift positions used for on my vehicle? "S" is for sport. If you're driving on twisty country roads and want to keep the RPM up as you wind through corners, the "S" position is where you want to be. In "S", the transmission holds lower gears longer for more power as you come out of the curves. "The "B" position favors lower gears, too, but for a totally different purpose. Just as you might shift a conventional transmission to Low on a long downhill grade; you can shift into the "B" position to increase engine drag and help slow the Corolla while coasting down a hill. How do I operate the rear hatch glass window on my Highlander? Open the latch by pressing the circular black button, beneath the rear hatch glass, just to the right of the Toyota emblem. The window unlocks and pops open. Then lift the latch up and open the window. To close the hatch glass, just pull or push the glass down. As long as nothing is obstructing the locking mechanism, the hatch glass will close and lock into place. Note: If the flip up rear hatch window is open, the power liftgate will not operate. What do the different colored lines indicate on my backup camera? The blue guidelines on the right and left indicate the approximate width of the vehicle and where it would go when backing straight up. On flat, level ground, the horizontal red guideline is about 18 inches from the rear of the car. The next blue line is about three feet. There are several things that can affect the camera and estimated distances. See the Owner's Manual for details. Disclaimer: The backup camera does not provide a comprehensive view of the rear area of the vehicle. You should also look around outside your vehicle and use your mirrors to confirm rearward clearance. Cold weather will limit effectiveness and view may become cloudy. Named after Charis, a goddess in Greek mythology, who was a symbol of beauty and elegance. "Ya" refers to the German expression of agreement, symbolizing the car's broad appeal in styling and representative of Toyota's next generation of global cars. Derived from the Latin prefix meaning "to go before". Venza is a combination of the words "venture" and "Monza," a city in Northern Italy with a racecourse named Autodromo Nazionare Monza. The name was chosen to represent venture, outdoor leisure and driving performance. What does the Toyota logo represent? In 1990, Toyota debuted the three overlapping Ellipses logo on American vehicles. The Toyota Ellipses symbolize the unification of the hearts of our customers and the heart of Toyota products. The background space represents Toyota's technological advancement and the boundless opportunities ahead.